AT the end of Saturday’s game at the Aviva Stadium, Johnny Sexton was skipping around with young Luke McGrath like they were a pair of kids giddy with excitement after having beaten England in the final game of this year’s Six Nations championship. Sometimes with the intensity and the hits and the pressure that surrounds a game like this, you can forget that behind it all these are just ordinary lads playing a sport and having a blast. You had to hand it to McGrath who came on in the last few minutes and made a huge impact on such a massive occasion. And he was just one of a dozen Irish players to stand out on a day when Ireland stopped England’s Grand Slam hopes and also put a halt to their hopes of breaking the record for the most international victories on the trot. Not that Ireland needed extra motivation to beat England, but on the 10th anniversary of that now infamous victory over England at Croke Park, Joe Schmidt’s men turned in a performance full of heart and aggression and precision. 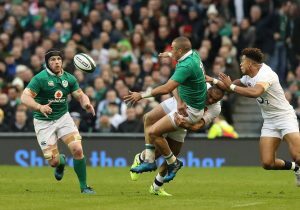 After 30 minutes of the game, RTE co-commentator Donal Lenihan told viewers that by that stage the Irish backrow, including Sean O’Brien, had made eight carries apiece as the team enjoyed 73 per cent possession. It never let up from there. And in hindsight, that needed to be the case. As dominant as Ireland were, they were never able to open up a substantial gap on their opponents and that’s why the hearts of Irish rugby supporters were in their mouths right up until the final play of the game when a try would have won the game and the Grand Slam for the visitors. But much like in Chicago where Ireland shrugged the New Zealand monkey off their backs, they just turned up the pressure a little more and suffocated England until they made a mistake. The fact that so many guys came on from the bench and made such a massive impact must be pleasing for Joe Schmidt. 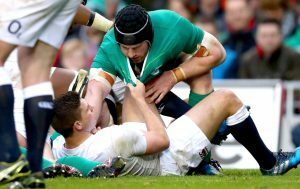 Before the game you looked at the Irish replacements and compared to their English counterparts there was a distinct lack of hard-nosed experience. But one by one the bench came on and played their part. You wondered how a player as immense as Keith Earls, currently in the form of his life, could be replaced but Andrew Conway more than held his own. No less a judge than Neil Francis once said Conway was the best schools player he had ever seen. While his ascendency to a full senior cap has taken far longer than people who watched schools rugby in Dublin a decade ago ever thought possible, the Dubliner who had to head to Munster to develop his career has finally reached that milestone. He’ll hope to build on that appearance during the summer tour. Which brings us to the other summer tour taking place: the Lions’ trip to New Zealand. Now that the Six Nations is wrapped up, the selection debates will begin in earnest. Johnny Sexton and Conor Murray look nailed-on certainties for the starting XV, injuries permitting, and there’s a fair shout that CJ Stander will bring his South African beef to the Lions backrow. Tadgh Furlong will take his position in the front row unless Warren Gatland starts playing silly buggers. Beyond that there’s some serious work to do for some Irish players. Of course, Sean O’Brien did his cause no harm at all with a mammoth 65 minutes on Saturday and he will be very close to making a backrow position his own. If Peter O’Mahony had been afforded more game time this season he too would have been thrown into the mix for a backrow place but you get the impression that it will be too easy for O’Mahony to be dismissed now as not having had enough game time during the Six Nations. But there’s plenty of time for those debates brew in the coming weeks while the club season swings back into action. For now, it’s enough to allow the mind to drift back on Saturday’s performance and recognise a group of players who turned up the heat so high that and buoyant England team was brought crashing back to earth. That’s a good weekend’s work by any standards.